So after I graduated, I started looking for places out in Brooklyn and like many people, I started my search on Craigslist. I’m sure every person looking for a place in New York City has seen listings purposely miscategorized by real estate agency, in the hope of getting a user to click to view details or even worse, get you to make the trek to see the place. One of my favorite examples is the listing of “East Williamsburg,” when in actuality the place is in Bushwick proper. By re-branding less attractive neighborhoods, real estate agencies are hoping to get people on the border of barely affording “nicer” neighborhoods to living comfortably in a “poorer” and often urban area of town. They are usually artists, then students, then hipsters and not for long rents prices go up, ultimately pushing local residents further away. The neighborhood landscape changes as well. Not for long, liquor stores and 24 hour pickup or delivery greasy food establishments are replaced by Whole Foods grocery stores and cafes serving 8 ounce wheat-grass beverages for 4 dollars. The beneficial side effect of gentrfication is that crime levels often drop significantly. My guess is the police is willing to protect the well-off than the poor and struggling. So in the beginning of May, I moved out to Bedford-Stuyvenant, often referred as “Bed-Stuy.” This neighborhood has yet to become “gentrified,” but earlier signs indicate such a change will occur sooner than later (after all, I moved in and I’m a student). I was walking home recently and because of the recent hot weather, families would sit outside, often late. A young girl, could not have been older than 8 years old sees me walking past her and she says to her father siting on the stoop, “Why is all these white people walking down our street?” I quickly replied to correct her to say, “I’m not white, I’m Korean,” which was followed by an uncontrollable laughter of her father. She doesn’t know it at the time, but that girl is talking about gentrification. 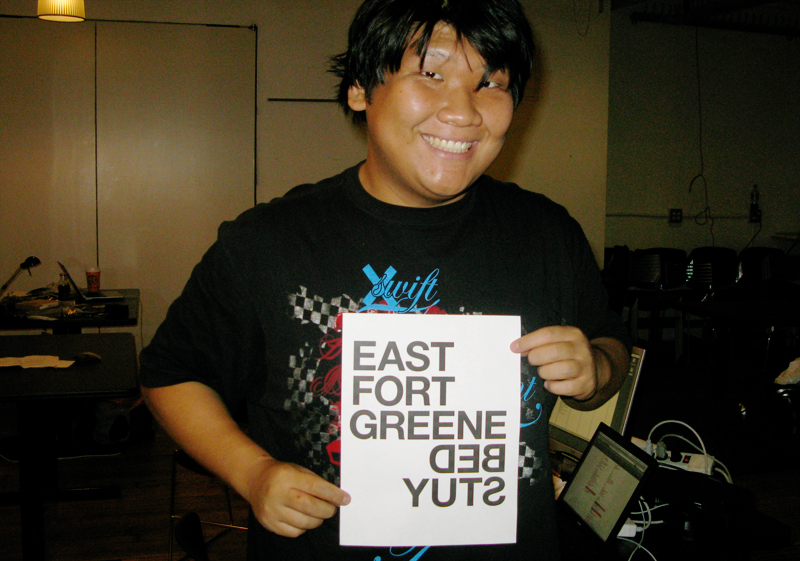 For my 5-in-5 project, I decided I wanted to silk-screen t-shirts, printed with the re-branded name of “East Fort Greene.” I wanted to beat real estate agencies to the punch, and bring awareness of changes in the neighborhood of Bed-Stuy. I would like to be clear in stating that I am neither for or against the gentrification process. There are both positive and negative effects of such changes but ultimately the real estate agencies make out on top. I did not anticipate the preparation needed to start silk-screening as well as the expenses needed to fund such a project. So today I spent the majority of my time building screens for the pressing the image onto the t-shirts and designing the image/text for the shirts.I also learned that it takes around 12 hours for the photo emulsion to dry, before a single print can be made. So in the mean time, here is my design for the t-shirts I will be printing tomorrow as well as write/shoot/edit a film with Christian. Kudos for being unique in your approach. I recall silk screening many years ago in “graphic arts” class in school. It’s great to see the old techniques resurface so people can appreciate the technology we have now! © NYU ITP 4-in-4 » Re-branding Bed-Stuy to Promote Gentrification 2010, All Rights Reserved.